I have only just got back to blogging after a two month break for Summer - time flies and all that! Despite the fact it’s 25 degrees outside today it’s time for an Autumn Wardrobe Round-up, the new season being in full swing. Hard to believe but if I don’t get my clients in the shops at the start of the season all the sizes start to sell out and the best pieces have been snapped up! The thrill of buying new things at the start of a fresh season and improving your wardrobe can help to stop that feeling of despair that summer is over and we have months of cold weather ahead! It’s an exciting time in wardrobe terms! - lots of people prefer autumn/winter when it comes to fashion because you can snuggle-up/AKA HIDE! under baggy jumpers, jeans and boots. Corduroy - wide legged cord trousers are notable in lots of high street stores at the moment including &Other Stories and Topshop. Also corduroy blazers are set to be huge in the 1970’s palette and also in pastels. Leopard print. Maybe I should’ve put this trend first as it is EVERYWHERE. Animal print in general is having a big moment. Check blazers. Yep, still here. Look great with jeans and come in every check and colour combination you can imagine. Metallics. Silver and gold or any fabric shiny is ‘in’. There are a lot of gloss/faux leather skirts and bin-bag style coats around. Fringing. Look around, there’s fringing springing up everywhere. Cowboy boots. Not sure I’d mix cowboy boots with the fringing trend for fear of looking fully ‘Clint Eastwood’ but separately I like the idea of fringing! I’ve never got along with cowboy boots mind you, it’s that toe curling thing they do that puts me off!! These burgandy culottes from Other Stories would look great with a chiffon floral blouse and longer boots underneath too. Masculine check blazer at Zara. Great with jeans and also over a feminine dress. Beautiful blue mac from Massimo Dutti with heritage print, reversible belt and removable fur collar. This comes u oversized so go a size down. It is Limited Collection so only a few have been made. Green metallic pleated midi skirt from Karen Millen. The pleated midi remains ever popular this season. 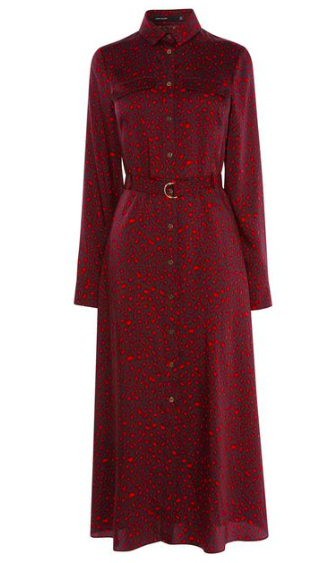 Not your usual colour-way for leopard print, I LOVE this Karen Millen shirt maxi dress. Available up to size 16. Or go for the more traditional leopard print like this mesh dress from Warehouse. A different take on the ankle cowboy boots, these beige suede from Isabel Marant are a bold choice! For Autumn ‘18 she had a western vibe running through the whole collection. Another Isabel Marant boot from this season with her signature fringing detail. Love these but too expensive for my budget! More affordable version below from Zara. 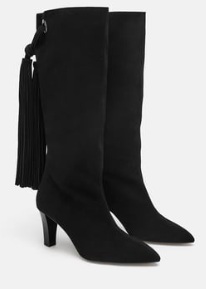 Zara black suede fringed boots in leather. My first style round-up of the season! Very happy about the metallic trend, anything sparkly and I’m fully on board. Not so keen on the cowboy boots! Get in touch if you want me to cover any particular subject in my blog and I will try and cover it next time. Lisa Gillbe is a personal stylist and personal shopper based in London UK. If you need help with your wardrobe, get in touch to enquire about Lisa’s availability for this season.